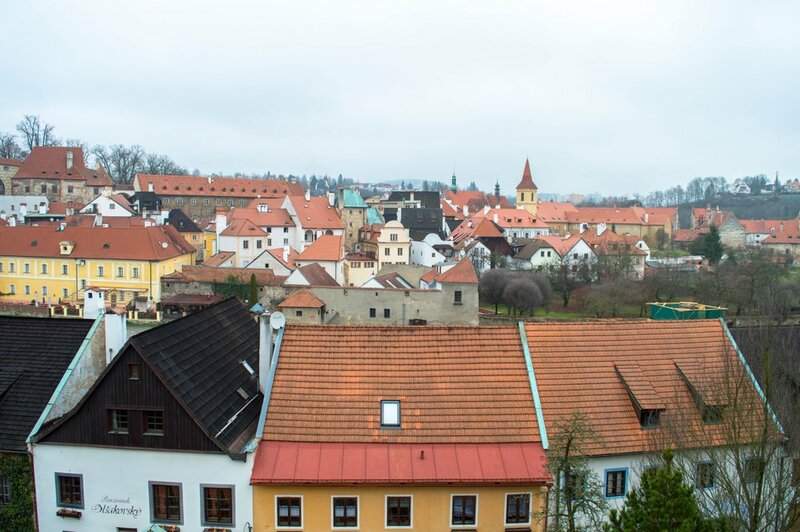 A few weeks ago we went to Czech Republic to visit our friends. During our stay we took day trips to different parts of the country. 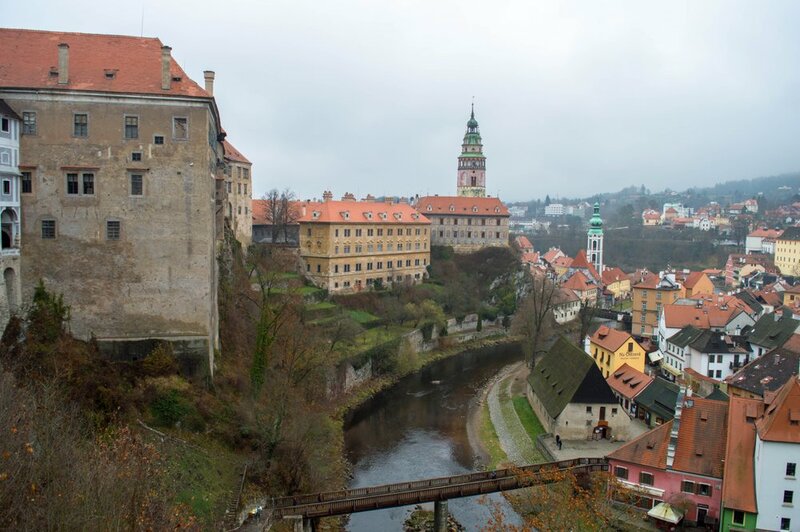 We spent one day in South Bohemia and explored a charming medieval town of Český Krumlov. 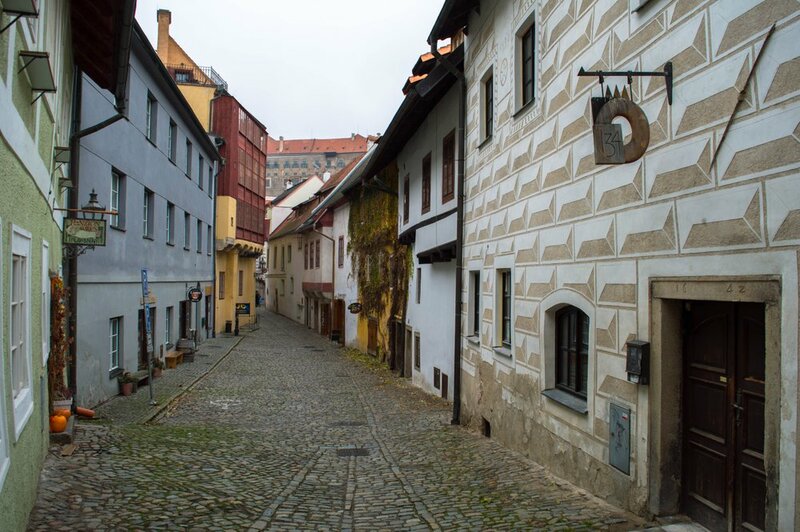 I lived in Prague for about 6 years and I've never been to this part of the country, so I was very excited to finally explore the town about which I've heard so much already. 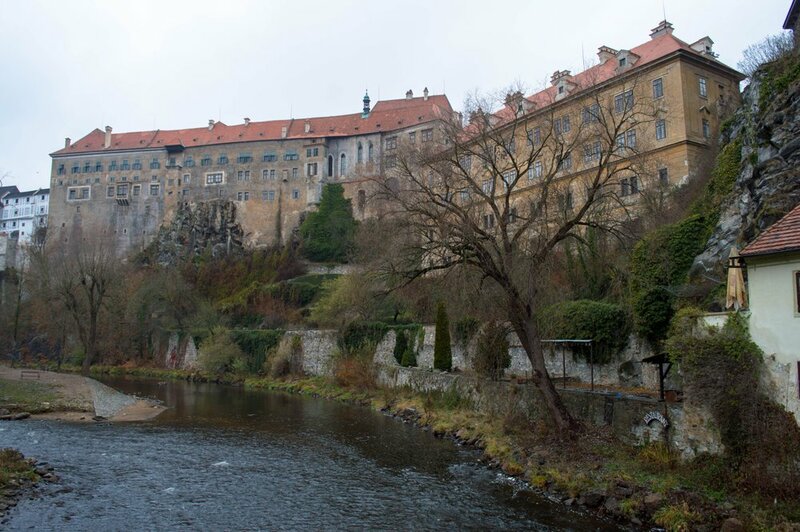 The town is built around a beautiful castle from the 13th century sitting on the rocks above the river Vltava. 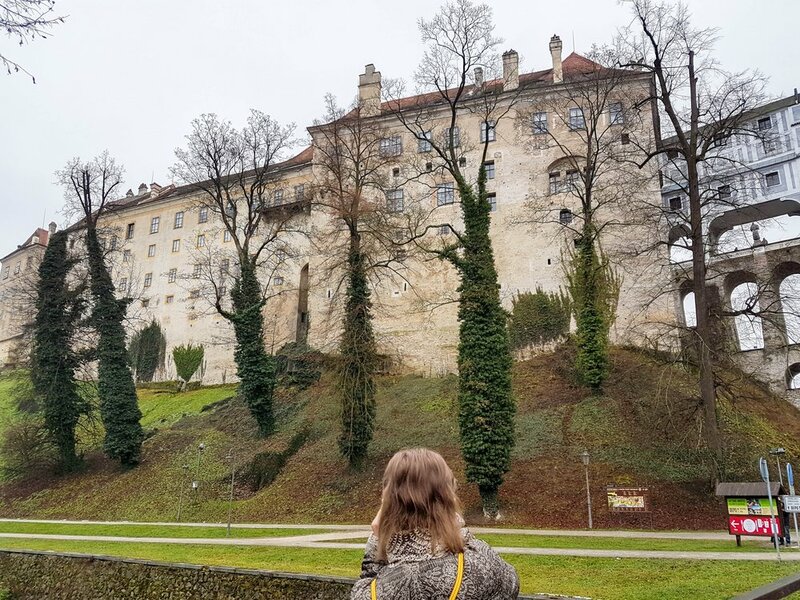 It is the second largest castle in Czech Republic which is very unusual for such a small place. Just to give you some perspective, you can walk from one side of the old town to the other in about 20-25 minutes. 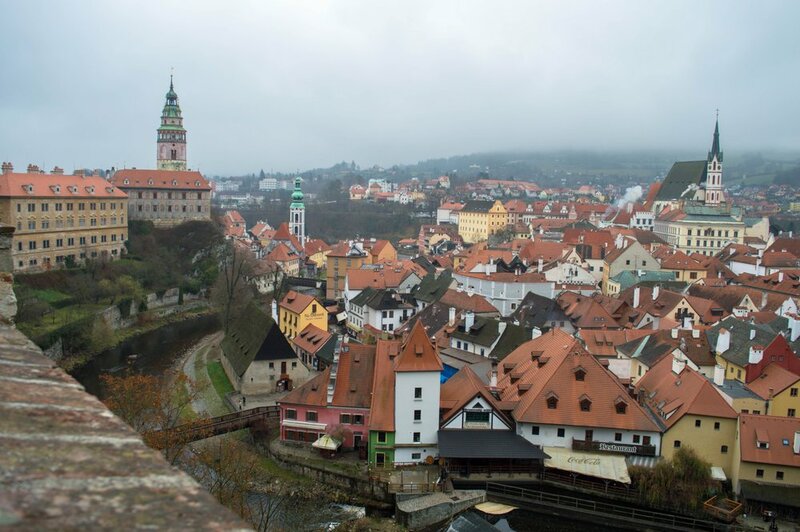 Český Krumlov is one of the most picturesque towns that I've ever visited. It is a small town but you can easily spend a few days there. You can admire beautifully colored houses, get lost in narrow streets, have a delicious meal in one of many restaurants or just walk around and enjoy the atmosphere. 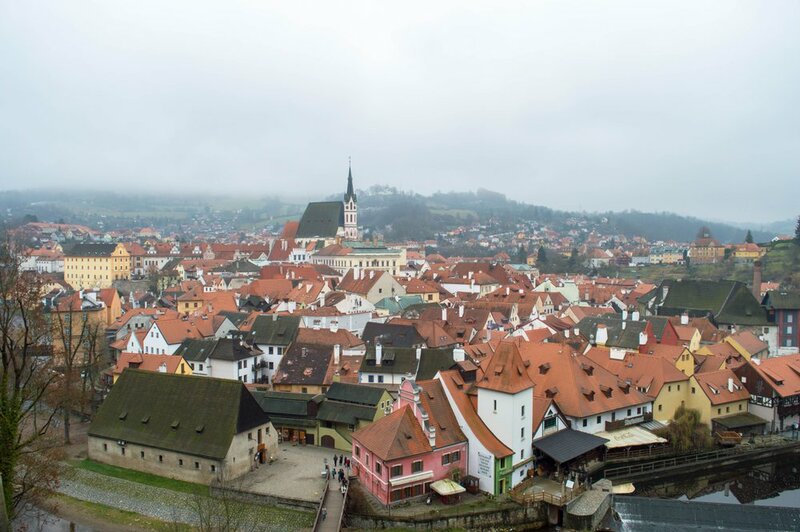 Český Krumlov was not affected by any conflicts over the last centuries and it retains its medieval appearance and layout. The old town is protected and any reconstruction must be done using traditional techniques and material. 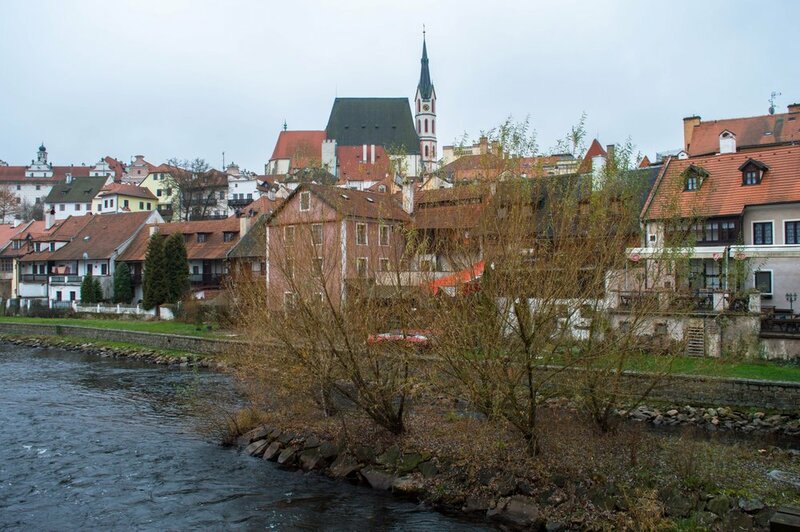 On the other side of the castle there is the St. Vitus Church with its original baroque tower. The first mention of the church dates back to 1329. It was established by Peter I von Rosenberg and consecrated by bishop of Passau Nicolas in 1439. The church has rather simple, neogothic interior but it's still worth a visit. You might be lucky and visit it during one of many concerts that are held there. In 1992, the castle was included on the list of UNESCO World Cultural Heritage Monuments. It dates back to 1240 and it changed the owners many times in its long history. It was built by the Witigonen family and after they died out in 1302, the castle was inherited by the Rosenbergs. The ownership transferred to the Habsburgs in 1602. They owned the castle only for two decades. In 1622, the Emperor Ferdinand II gave the castle to the Eggenbergs. in 1719, the castle was passed on to the Schwarzenbergs. The castle became the administration center and it retained its function for 100 years. The Schwarzenbergs lost many of their properties after the Land reform in the 20th century. 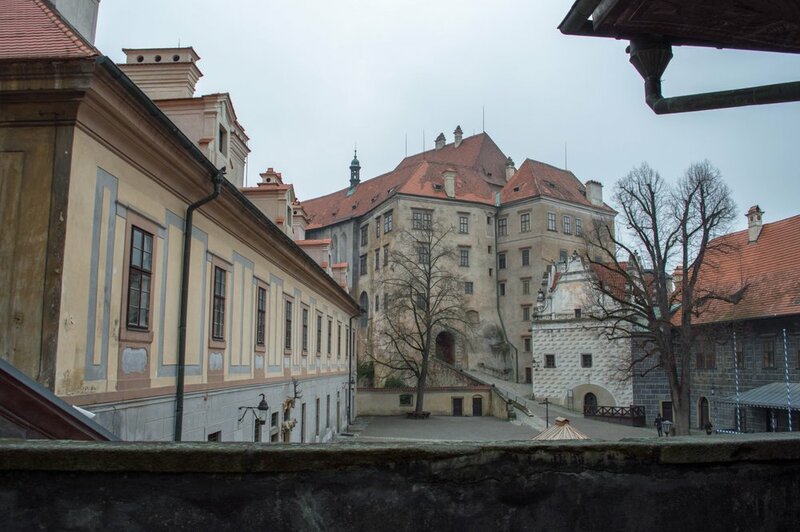 In 1950, the castle transferred its ownership to the Czechoslovak state. You can only visit the castle with a tour guide. However there were no tours available as the castle is closed for winter. At least you can walk around and enjoy the views, so let's do it before we visit the castle museum that is open even during the winter months. The complex is huge and it's very nice to walk around even though you can't enter the castle. We followed some people who were there before us and after a couple of minutes we got to see spectacular views of the town. If the weather would be better we could have seen the surroundings too 😊 One of the reasons to come back..
Another reason would be that the gardens were not open. I've heard that they are beautiful and would like to visit them as well. This is how we came here. It looks like a part of the castle was built on a bridge connecting the main castle building with the gardens. The corridor is nicely decorated and offers spectacular views too. 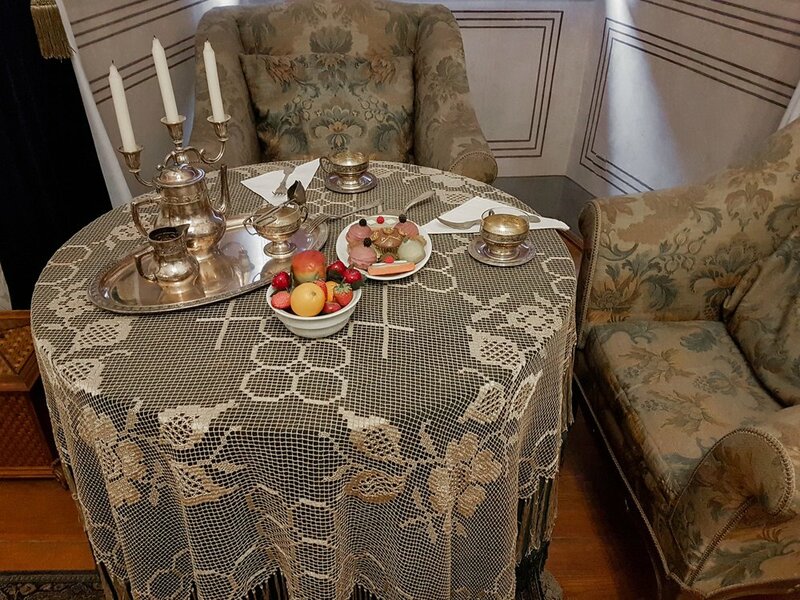 The exhibition will send you back to the times of noble families living on the castle. 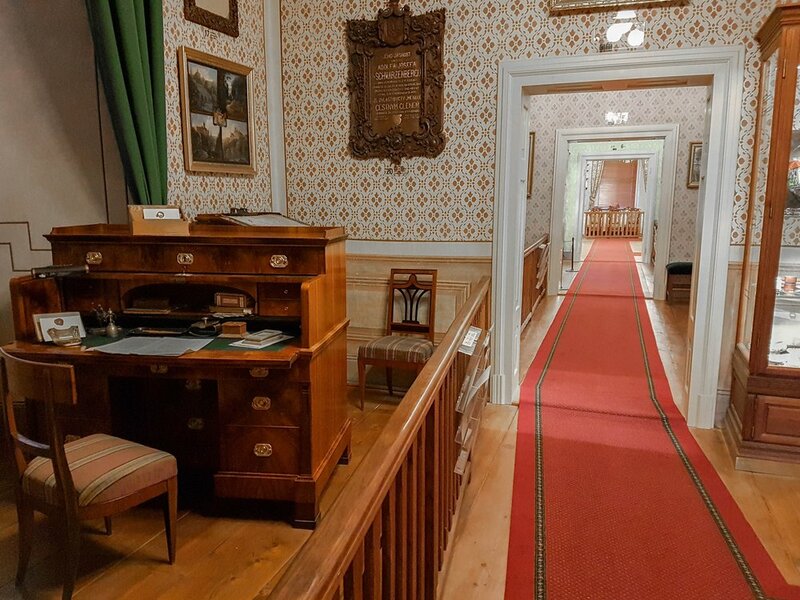 There are many different rooms showing the life of the lords of Český Krumlov. 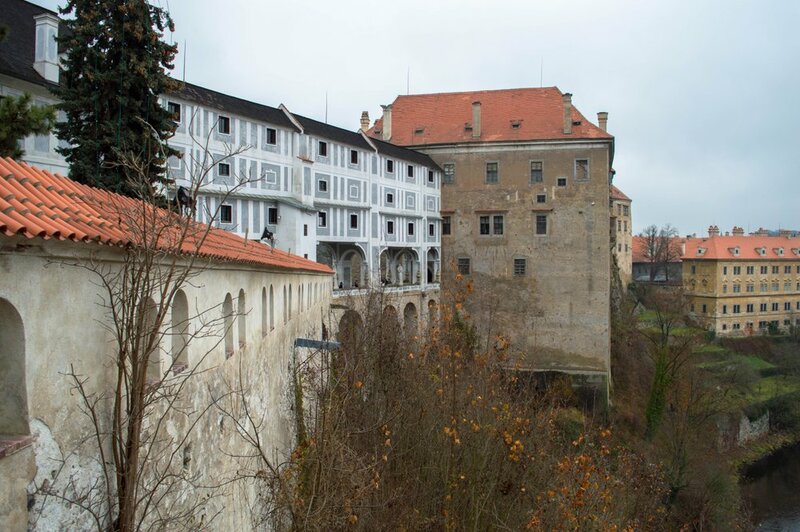 The exhibition starts in The Hall of the Dukes of Krumlov. 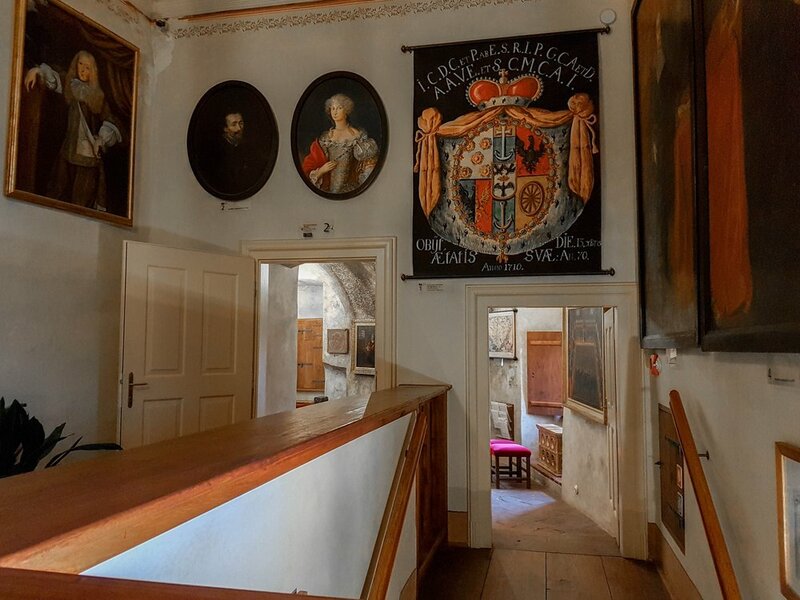 You can find there portraits of the dukes, the arms of the noble families, the seal of the duchy of Krumlov, diplomas, books and many more. You can take your time to read and learn about the families who lived in the castle for centuries. 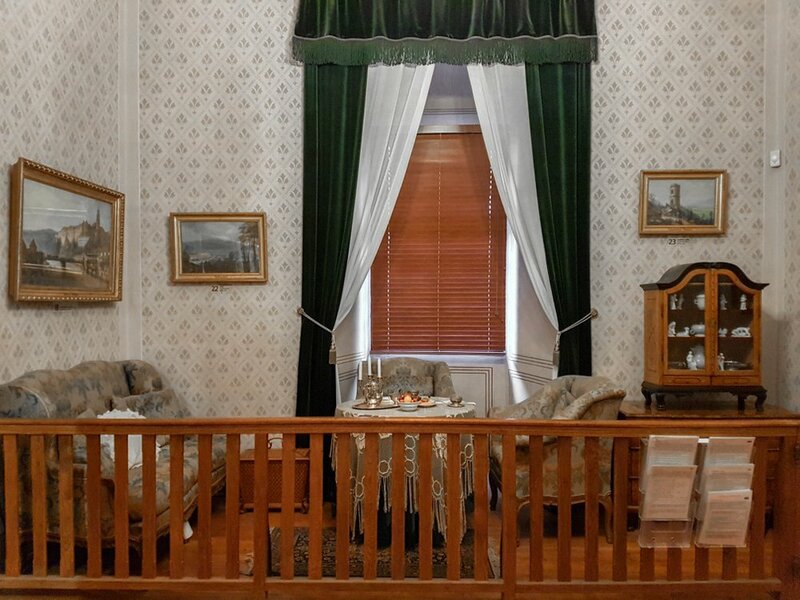 Once you are familiar with the history you can follow the route and visit separate rooms. A lot of economic officers during the Schwarzenbergs time worked here. 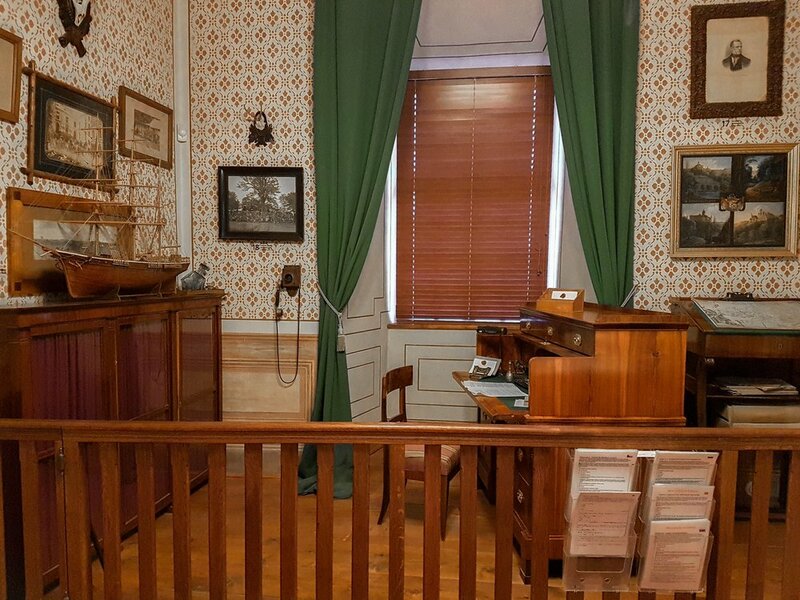 The Administration office in the museum is furnished with the authentic furniture according to the old photographs. We can see here paintings depicting various interests and businesses of the family, such as the water transportation of wood harvested in the nearby forests, agriculture, forest management and hunting. The economic efforts of the Schwarzenbergs were honored with various awards. Some of these awards are shown in this room as well. The Salon was used to host guests after dinner. 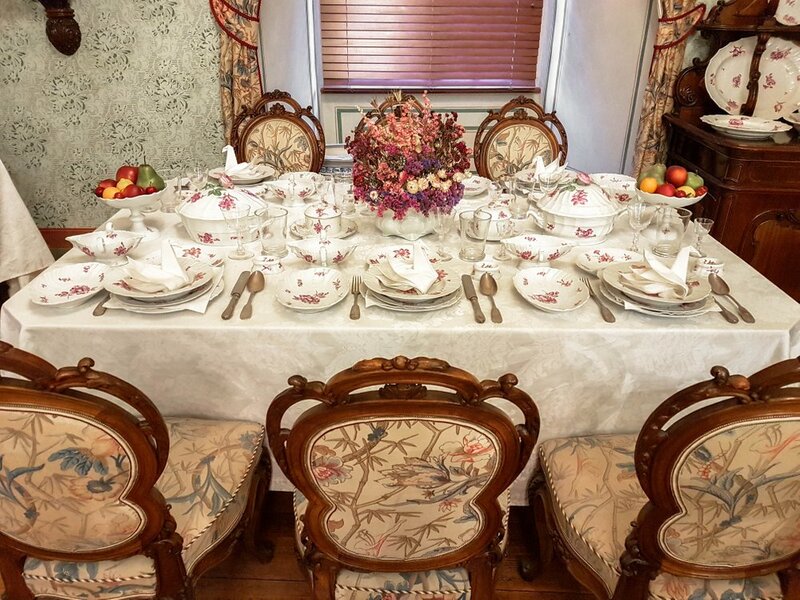 It was equipped with a display case which was used to store coffee or tea sets, cutlery, dessert plates and other beautifully decorated necessities to make the guests feel welcomed and valued. 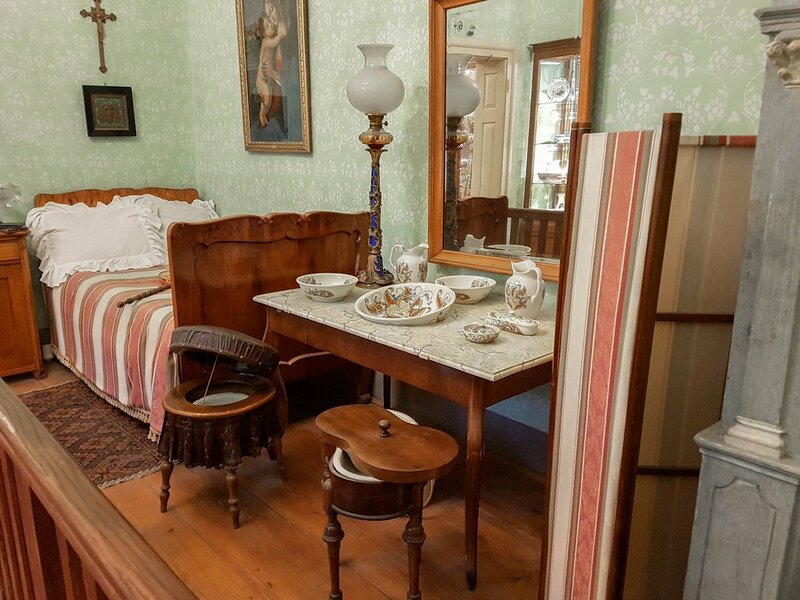 The Bedroom was equipped to satisfy the needs of noble families in the 19th century. There was a basin, a jug with water, a soap, toothbrushes, a bowl with a lid for tooth powder and a bowl for a hair brush. There was also place for a standard toilet chair. 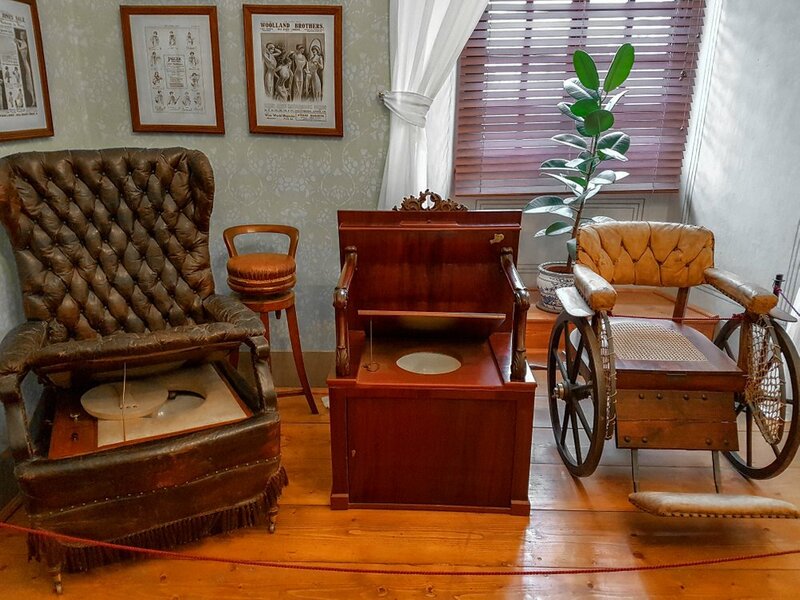 On the other side of the room there are different types of toilets that were used in the 19th century in Central Europe. 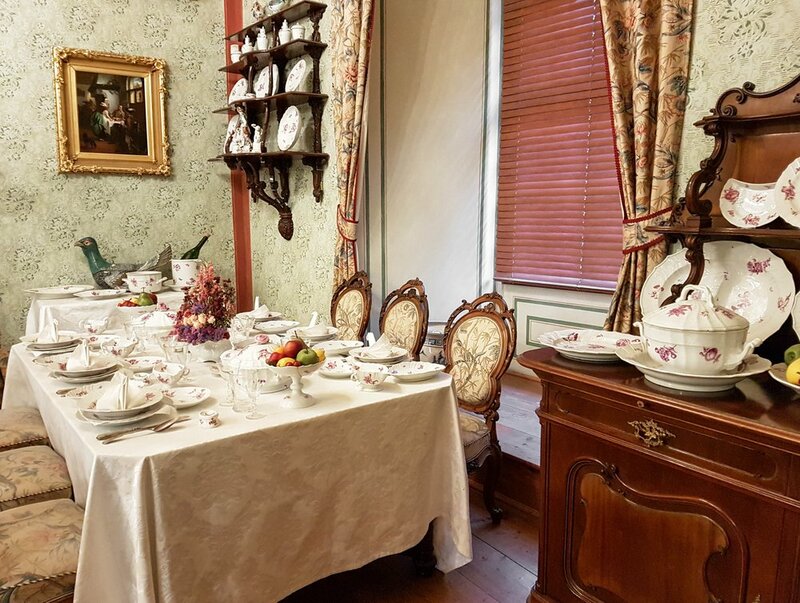 The Lady of the house was hosting dinners in The Dining Room. She didn't serve the dinner personally as she had a maid to assist her with bringing food to the table. She was managing the household with help of her maids. A large table in the middle of the room is surrounded by padded chairs. 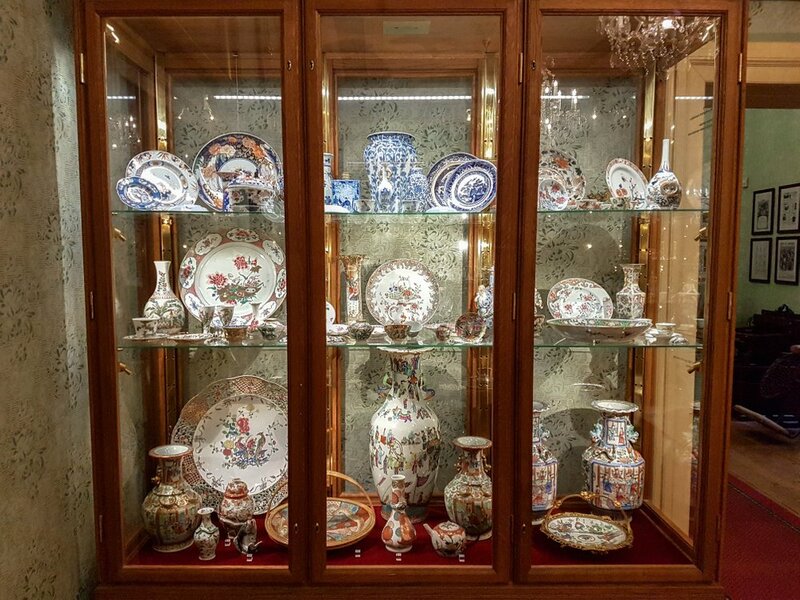 There is a display case with stunning porcelain and beautiful decorations for the table. It would be an extraordinary experience to dine in such a room.. There is also a big showcase with Asian porcelain. 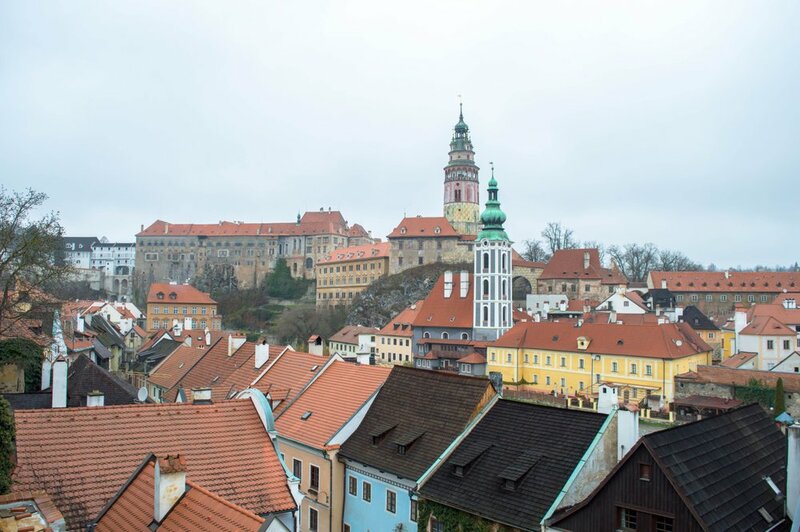 Most of it was sent to Český Krumlov by Karl Lorenz Schwarzenberg from Tokyo as he served there as a secretary of the Austrian Embassy. Let me show you one more room.. The Treasury of Sacred Art includes the box reliquary with the remains of St. Reparat. 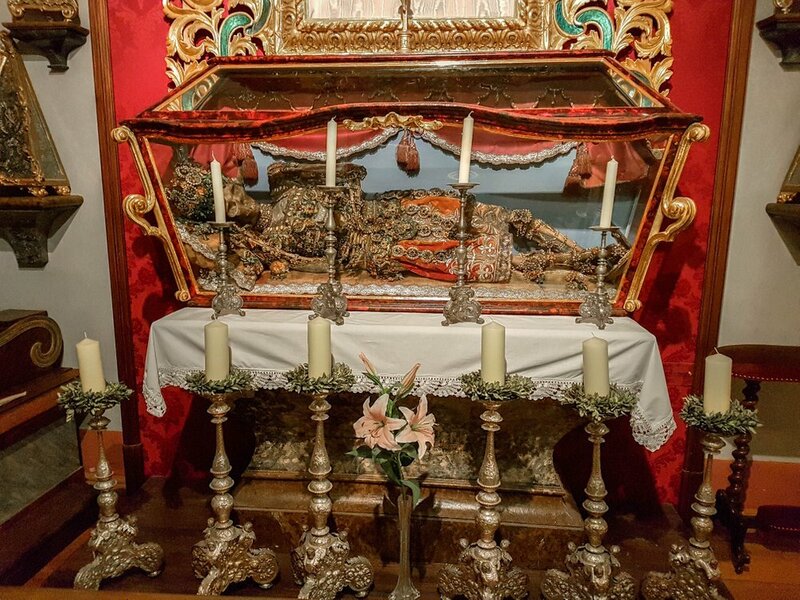 The remains came from the catacombs in Rome and were placed in the monastery church in 1772. I cannot recommend this charming town enough. It's a perfect place for those who love beautiful architecture and long history. I hope you have enjoyed our tour!